In Eccles in Lancashire during the 1790s, people would queue outside James Birch's bakery eager to buy his flat, currant-filled cakes. Nowadays, Fergus Henderson of London's St John restaurant is known for his version, served with a wedge of Lancashire cheese. This scrummy recipe is from his book Nose-to-Tail Eating (£16.99; Bloomsbury). To start the pastry, mix the flour and salt. Cube 125g of the butter and rub into the flour until the mixture resembles breadcrumbs. Then cautiously add the water, stopping when you have a firm dough. Pat into a square and wrap in clingfilm. Chill for at least 1 hour. Roll the dough into a rectangle 8mm thick and twice as long as it is wide. Put the remaining 375g butter between 2 sheets of greaseproof paper and use a rolling pin to beat it into a square slightly smaller than half the dough rectangle. Lay the butter on one half of the dough, leaving a border at the end. Fold the unbuttered half over the butter and seal the edges so the butter is enclosed in a dough package. Pat the whole thing into a square, wrap in clingfilm and chill for at least 15 minutes. Roll out the pastry in the opposite direction to your initial fold. (Each time you roll the pastry, turn it 90° and roll across the previous direction you rolled. You'll need to dust flour on your rolling pin but it's important to dust the flour off the dough before folding it.) When the pastry is 1-1.5cm thick and about 15 x 45cm, fold it in three, like a letter. Pat square and chill for at least 15 minutes. Repeat the turning, rolling and folding twice, but no more. Chill for another hour or more. To make the filling, melt the butter and sugar together gently over a low heat, then add them to the other filling ingredients, mix well and leave to cool. Preheat the oven to 220°C, gas mark 7. Roll out the pastry to 8mm thick and cut circles approximately 8cm in diameter. Spoon a blob of filling into the centre of half the circles, brush egg white around the edge, and top with the remaining circles. Seal the edges, gently flatten the cakes, then slash the tops 3 times. Paint with egg white and sprinkle with caster sugar. Put on a baking tray with a lip (they'll ooze some butter as they bake). Bake for 15-20 minutes. Serve hot or cold. 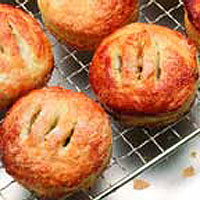 Go straight for the authentic taste by buying a pack of Real Lancashire Eccles Cakes. These buttery cakes contain a delicious type of currant called Vostizza, grown in the Peloponnese in Greece, and are delightful served slightly warmed.